Great hardware ruined by crap software. very interesting phone actually. 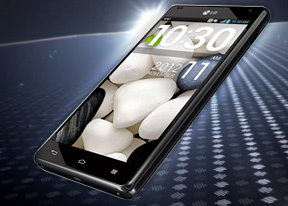 but i don't think i will buy any lg phones anymore after my experience with the optimus 2x. As I have previously, when you have hardware approaching the realm of what a netbook can deliver, yet the software is lagging well behind, it is time to sit a wait for what Android might come up with, or even look to WP8. Ok so all the top end and mid range Android phones are good gaming devices, nice screens, ok with videos, nice cameras, and you can even make a telephone call. So what. Where is the real business and personal integration software advances. Too much focus is on time wasting interface and speed at which you can move widgets, or customisation, all of which deliver no real benefit at all. Good job LG but wasted with the inherent constraints of Android. "geeks who are looking for the ultimate performance have little choice, but to opt for the LG Optimus G"
"geeks who are looking for the ultimate performance have little choice, but to wait for a few weeks when this device will be outperformed and the OS outdated, thanks to its own brother, the Nexus 4." Looks like a great phone but half speed 3g no micro sd and removable battery are big downers for me. Ps gsm arena... please stop saying all plastic bodys are a negative point. I have the note 2 and the build quality is awesome.... it is all plastic. Needs a microSD slot. Then it's perfect.